Air pollution can cause more droughts and floods, a new long-term study has discovered. The research from top scientists studying a decade of atmospheric data has shown how cloud and weather development are affected by aerosols in the atmosphere. The findings have vital implications for the worldwide availability of water. The dust, soot and additional particulates can produce intense rain, snowfall and severe storms, while further reducing rain in drier areas. 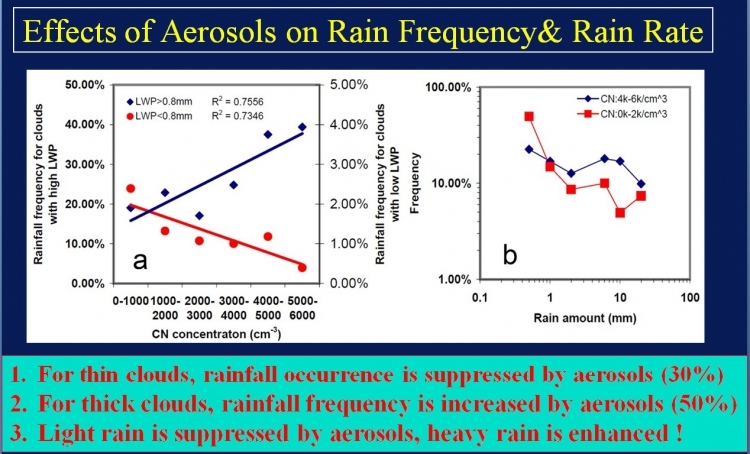 Zhanqing Li, lead author of a paper published in Nature Geoscience and University of Maryland atmospheric scientist, says, "Using a 10-year dataset of atmospheric measurements, we have uncovered the long-term, net impact of aerosols on cloud height and thickness and the resulting changes in precipitation frequency and intensity." The other co-authors are Yanni Ding and Feng Niu, who are also from the University of Maryland; Yangang Liu, of the U.S. Department of Energy Brookhaven National Laboratory; Jiwen Fan, from the U.S. Department of Energy Pacific Northwest National Laboratory and Daniel Rosenfeld, of The Hebrew University of Jerusalem. It is vital for climate change scientists to discover more about how aerosols affect the formation of clouds and weather, says Chungu Lu, program director of the National Science Foundation's Division of Atmospheric and Geospace Sciences that financed the research. He says, "The question is not only important for our understanding of the effects of natural processes and human activities on climate change, but for addressing issues in air pollution, disaster relief, water resource management and human weather modification." Russell Dickerson, another atmospheric scientist at the University of Maryland, adds, "We have known for a long time that aerosols impact both the heating and phase changes [such as condensing and freezing of clouds, and that they can either inhibit or intensify clouds and precipitation. "What we have not been able to determine until now is the net effect. This study shows that fine particulate matter, mostly from air pollution, impedes gentle rains while exacerbating severe storms. It adds urgency to the need to control sulphur, nitrogen and hydrocarbon emissions." Steve Ghan, from the Pacific Northwest National Laboratory, says, "This work confirms what previous cloud modelling studies had suggested: that although clouds are influenced by many factors, increasing aerosols enhances the variability of precipitation, suppressing it when precipitation is light and intensifying it when it is strong. "This complex influence is completely missing from climate models, casting doubt on their ability to simulate the response of precipitation to changes in aerosol pollution." 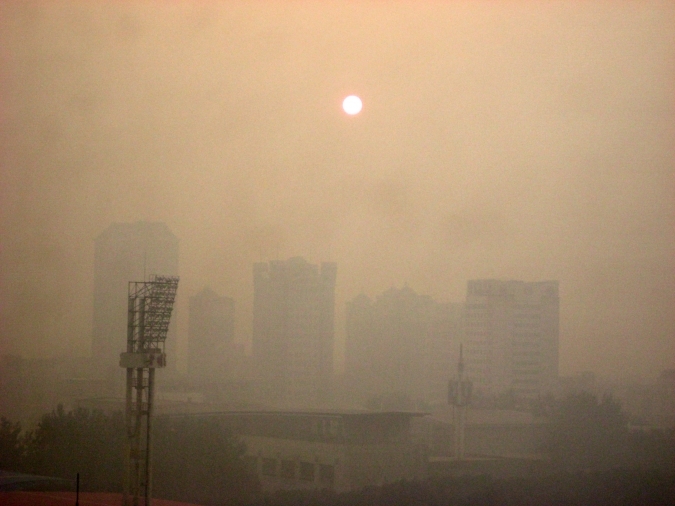 Aerosols, that include dust, soot and sulphate particles, consist of solid or liquid particles suspended in air, are classic causes of air pollution. They are created from burning fossil fuel and can cause health problems. The particles also reflect light into space and so affect surface temperatures. They can also alter the properties of clouds and the amount of precipitation. Along with greenhouse gases, they have a major effect on climate change. Scientist Steve Schwartz, of Brookhaven National Laboratory, says, "This study demonstrates the importance and value of keeping a long record of continuous and comprehensive measurements to identify and quantify the important roles of aerosols in climate processes." "While the mechanisms for some of these effects remain uncertain, the well-defined relationships discovered demonstrate their significance. Controlling for these processes in models remains a future challenge, but this study clearly points to important directions." Chungu Lu adds, "The findings from ground measurements of long-term effects are consistent with the global effects revealed from satellite measurements reported in our separate study. "They attest to the needs of tackling the climate and environmental changes that matter so much to our daily lives."